Each Premium Number Candle is packed in a box of 12 pieces. It is available in digits 0 to 9. Premium Number Candle is better finished and bigger in size, then the Economic Number Candle. Happy birthday printed number candles. 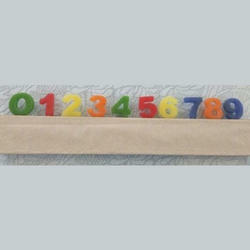 Matching up with the requirements of our clients, we are involved in offering Number Candle. We are dedicatedly involved in providing a wide array of 1 Number Birthday Candle. We are instrumental in offering Colored Candle to our clients. These products are developed using high quality materials. Our presented series of Birthday Number Candles is enormously demanded in the market for their long-lasting nature and superior finish. - Birthday Number candles in red colour. Set of 10.